In this post I will briefly sketch the overall purpose of What Is the Mission of the Church? by Kevin DeYoung and Greg Gilbert. In subsequent posts I will engage the biblical, theological, and ideological arguments that support their larger intention. DeYoung and Gilbert write to bring clarity to the discussion regarding the purpose of the church. They “want to help Christians articulate and live out their views on the mission of the church in ways that are more theologically faithful, exegetically careful, and personally sustainable” (p. 24). Their central contention is that the “church is sent into the world to witness to Jesus by proclaiming the gospel and making disciples of all nations” (p. 26). This involves “gathering these disciples into churches, that they might worship the Lord and obey his commands” (p. 62). The discipleship of which they speak is carried out within the church and involves cultivating “a life of poverty of spirit, meekness, mercy, purity, and peace” (p. 127). For DeYoung and Gilbert, this is the central task with which the church must concern itself. The remainder of the book distinguishes this singular mission from the variety of things in which individual Christians may be involved. This is a very important distinction for DeYoung and Gilbert. The church gathers and focuses on discipleship and worship. These are essentials, what the gathered church ought to do. When the church scatters, individual Christians can be involved in good deeds in the world, but they are not obligated to do so. The majority of the book makes this singular point. It is commendable for individual Christians to do good deeds in the world, contributing to culture, meeting others’ needs, helping the poor, and fighting human trafficking. For the church, however, these are distractions from the main task of proclaiming the gospel and making disciples (p. 193). One of their main concerns is that Christians have been made to feel guilty in the past for not doing enough to alleviate suffering in the world. They “want Christians freed from false guilt—from thinking the church is either responsible for most problems in the world or responsible to fix these problems” (p. 23). Some Christians make it sound like every poor person in Africa is akin to a man dying on our church’s doorstep, and neglecting starving children in India is like ignoring our own child drowning right in front of us. We are told that any difference in our emotional reaction or tangible response shows just how little we care about suffering in the world. This rhetoric is manipulative and morally dubious (p. 185). 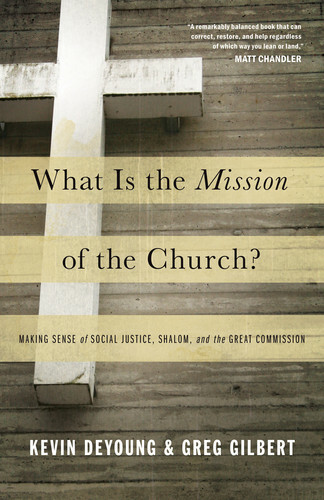 They claim that this rhetoric comes in the form of talk among Christians about “social justice,” “restoring shalom,” and “advancing the kingdom.” They address each of these topics throughout the book, attempting to place them properly in relation to the central mission of the church. I’ll engage their treatments in future posts. This is not a book by and for biblical or theological scholars. We will deal with a lot of texts and interact with a lot of theology (and hopefully will do so responsibly), but we are not attempting a scholarly monograph on a biblical theology of mission (p. 25). I’m engaging their work for the following reasons. I committed myself to biblical scholarship precisely because I am compelled to serve the church out of love for Jesus Christ and the wonder of being included among the people of God. My life is in service to the church and I want to play my role in discerning between life-giving words and destructive counsel. Second, the authors present a vision for the mission of the church based on a range of theological notions and biblical texts. It is inappropriate to criticize them for failing to handle them as scholars—they’re writing to a broad lay audience. They must, however, be read carefully to see that they have handled Scripture and theology faithfully. I love your generous, thoughtful spirit Tim. I don’t want to make judgments on a book without having read it and my biases are abundant. But it’s hard for me to wrap my mind around how we can proclaim Jesus and make disciples of all nations without caring about the dying child in Africa etc. As you know well, the evangelical church had “succeeded” at preaching the gospel in Rwanda just months before the genocide broke out. I do think there’s something about moral proximity that says I need to attend to the needs of my own child first and foremost. But in today’s globalized world, the thought that I can be a disciple of Jesus without being obliged to care for my global neighbor is inconceivable. I admit, there’s a part of me that wishes I could ascribe to that kind of interpretation. Thanks for being a thoughtful, provocative, grace-filled voice for such a time as this. Thanks for this, Dave! I certainly have my biases, too, and so I wanted to read this book carefully to see how they configured things. I’ll comment on the rhetorical frame of the book down the road, but I’ll just say that their tone seriously provokes a reaction. I had to put it down for a few days to think through it and make sure I was really grasping their argument on its own terms. It was also helpful to talk with others who read it and who reacted similarly. Looking forward to your engagement with this book. In your previous post, you talked about the “tribalism” permeating our Christian cultures, where we almost have different “versions” of Christianity that we can choose to follow. Now that you’ve laid a synopsis of this book, I am totally seeing how their main points feed into this “tribalistic” thrust. These thoughts have brought me back to a major emphasis in Dr. Cook’s class. He uses an airplane analogy, with one wing being the social justice, concern for the here & now, and the other wing being the evangelistic, sharing of the gospel. The two wings create a holistic ministry. But is this too simple for our modern Christian culture?? Part of me is afraid that it is! Sidenote: For a class, I recently read “Encountering the Theology of Mission” by Ott, Strauss, & Tennent. I was blessed by it and it engages Scripture and theology faithfully! Yeah, Haddon, that’s an important component to the book. It’s rhetorical frame indicates that it’s meant to function to reinforce boundaries between evangelical camps. I’ll say more about this down the road, but I see some serious theological problems here and also a serious socio-rhetorical problem. I just don’t think it’s good to reinforce the fortresses some have built to keep Christian from one another. Oh yeah, I also thought about Cook while reading this. I was thinking of asking him to engage it, but I’m not sure if that’d be an act of cruelty! At the same time, it might power him as he cracks off a few 15 milers!! I’d love a Cook review! I’m looking forward to your coming posts. Thanks for engaging this! So you did decide after all to review critically the book. Good for you! I’ll look forward to see what you have to say as well. Yeah, I figured I’d jump in. It’s too important of an issue on so many levels and in so many ways. Yes, good of you to engage it, Tim, especially as a biblical scholar. If a book and its ideas can’t stand under the scrutiny of biblical scholars and theologians, why would they think it’s appropriate for the “real” people they’re writing for? I’d say the quoted portion is as much of a cop-out as Bell’s “I’m no biblical scholar or theologian” card he tried to play in response to his critics. It’s as appropriate to engage them as they did him for the same reasons you listed: to see if they handle Scripture and theology faithfully. Jeremy- do you think that it’s possible that it’s not a problem of “imbalanced emphasis on kingdom work” so much as just an overall small view of the gospel? If the gospel is truly transformative and results in new creations, how can you possibly over-emphasize kingdom work?? Maybe this generation is just aching to hear the gospel as more than just how to get to heaven but as the incredibly full, good, transformative news that it really is. Hey Jeremy — it seems that our perception of what is being overemphasized at any one point is determined by our context. I don’t know who is saying what at any one point. I don’t know that there’s a good gauge that will tell us how much emphasis on each should result in the right view. It seems to me that churches need to figure this out for themselves rather than rely on what is said at this or that conference, or what is emphasized in this or that publication. But I must say, after being involved in a missional church for 6 years in a city that’s full of poverty that there were lots of churches doing proclamation, meeting on Sundays, etc., but relatively fewer Christian people seeking to creatively embody the gospel to people who were seriously hurting, lonely, hungry, etc. And I guess the issue really is, ‘what is the gospel’, as our authors indicate. And if it involves actual embodiment of the gospel reality by gospeled people, then perhaps there has indeed been a shortage of that. One other thought — it’s hard to know when things are balanced or out of balance. Perhaps we’ve grown up hearing about proclamation all the time so that one or two conferences or messages about putting it all into practice sounds ‘imbalanced’ because we’re just not used to hearing it. Or, we’ve heard it a few times and are sick of it. It’s tough to know what measurements are indicating that things are ‘imbalanced’ at any one point. Tim, thank you for taking the time to critically interact with this book. I really look forward to it. I agree with you that our different contexts determine how the gospel should be proclaimed/embodied in practice. I belong to a Christian community in an inner city suburb. There is much hopelessness/powerlessness within the local community due to all sorts of economic poverty and social marginalization. The traditional “proclamation” model hardly works. The reason is that people on the street are suspicious of Christians’ behaviour in the public square. They long for genuine relationships. My deepest longing is to proclaim Christ, and I won’t be hesitant to do that when there is an opportunity. But in my context people are looking for authentic love that only a Christ-centred and Spirit-filled community can provide. Thanks so much for engaging this book. Young people such as myself need to hear critical & counter-voices to the neo-reformed right now. It’s such a popular movement and is often spoken of as if it’s a natural expression of your Christianity and anybody with a brain or who reads the Bible will naturally join it. I know folks like you and I don’t want to use tactics that so often characterize them (e.g. overly-critical heresy hunting & constantly defining ourselves by what we’re not), but I don’t see you providing this review as being that way. The only way people will be exposed to a more robust Gospel, ecclesiology, & theology in general is if scholars such as yourself call this for what it is. Hey Luke, there’s no virtue at all in having a critical spirit toward one another, but we’ve got to have critical minds in thinking carefully how to live in obedience to Jesus. I hope that’s what I’m doing and how I’m treating the authors of this book. We all are, in the end, siblings in Jesus.